How to use Active@ LiveCD for backup and restoring data? How to use Active@ LiveCD for data backup and restoration? 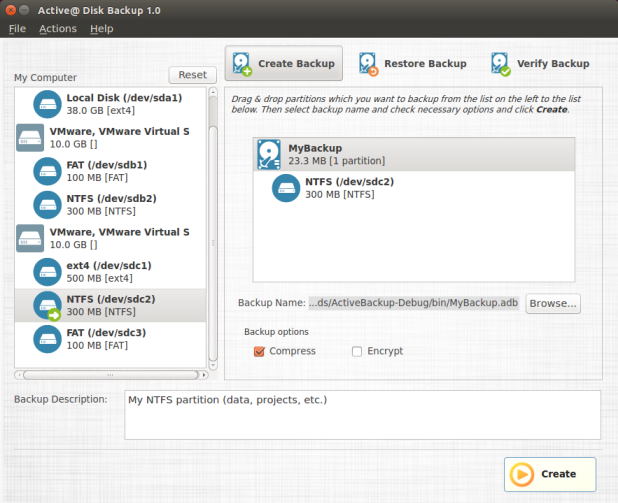 Active@ Disk Backup for Linux allows you to create an exact image of the data stored in selected partitions of a hard disk. You can protect your valuable data by regularly creating a disk backup and keeping it in a safe place. If you have trouble with data corruption, you can easily restore the data. Under backup list there are two checkboxes named Compress and Encrypt. If you want backup to be compressed (default option), select Compress checkbox. Since data on the disk you backup may contain sensitive information you might want to encrypt the contents of your backup. To do it, select an Encrypt checkbox. You will be prompted for a password to use for encryption. Please make sure you don't lose your password, you will need it to restore the data back and without the password it will be impossible to restore your backup. 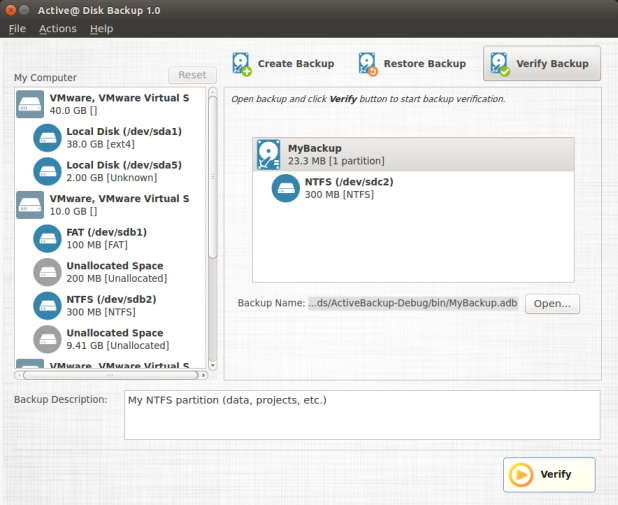 You can optionally add a description to backup that you are creating. To do this click on the backup item in the top of the backup list. The property panel down the window will show a text field for backup description. Enter any text description you like. As soon as you entered the minimum of required information (i.e. backup name and at least one partition selected for backup) the Create button in right bottom corner of the window will be enabled giving you the ability to start making a backup. As soon as all parameters are set, click Create button to start backup creation. You may interrupt backup creation process by clicking on Cancel button. Note: During backup creation process all controls in the main windows except Cancel button are disabled and become enabled only after backup is complete or canceled. 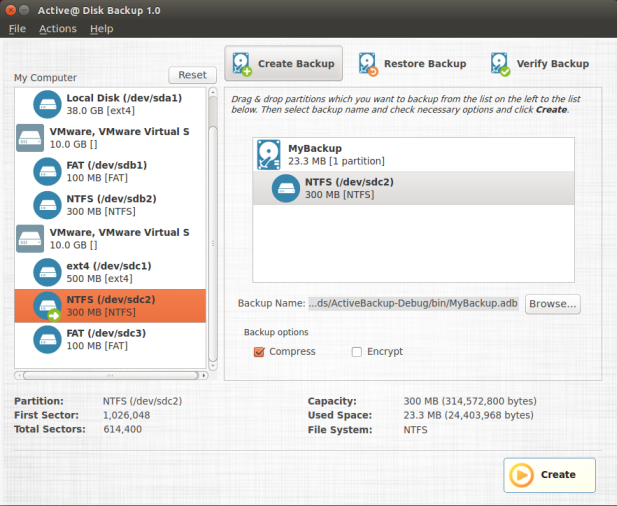 Click on Open… button and select an existing backup. Active@ Disk Backup will open file and display backup information in backup list in the right part of the main window. 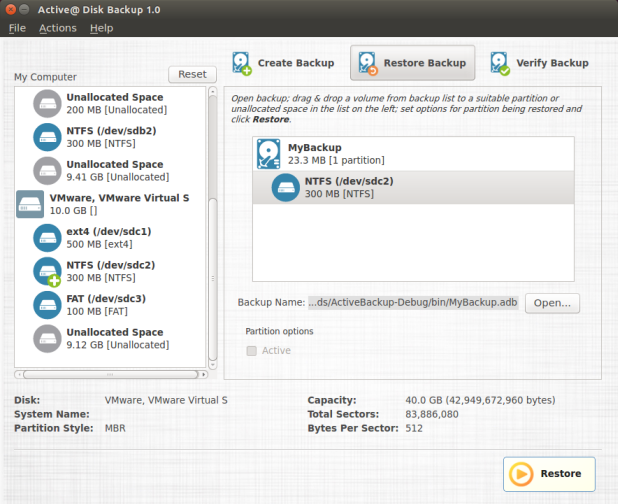 It will include backup name, data size and list of all partitions in backup. If you select one of the items in backup, the properties of the item will be displayed below partition and backup lists. To see a backup description, select the top item in backup list. Backup description field will appear in the bottom with text you have provided when created a backup. If backup is encrypted, you will be prompted to enter a backup password. Backup could not be restored without a valid password. Drag and drop a partition you want to restore from the backup list on the right to the partition list on the left. As soon as you drop a partition its icon in the partition list changes reflecting its status as restored. You need to drop partition on existing partition of the same or bigger size or on unallocated space of the same or bigger size in partition list. As soon as you defined partition you want to restore, click Restore button to start backup restoring. While disk backup is in progress, Restore button is replaced with Cancel button and to the left of it progress information is displayed. It includes the current operation, amount of data processed and time left. You may interrupt backup restoring process by clicking on Cancel button. Note: During backup restoring process all controls in the main windows except Cancel button are disabled and become enabled only after backup restoring is complete or canceled. At the top of the main window there are three buttons corresponding to three main actions of Active@ Disk Backup. Select Verify Backup to switch to backup verification mode. Alternatively you can choose Actions > Verify Backup in the main menu. Click Verify button to start backup verification. While disk backup verification is in progress, Verify button is replaced with Cancel button and to the left of it progress information is displayed. It includes the current operation, amount of data processed and time left. You may interrupt backup verification process by clicking on Cancel button. During backup verification Active@ Disk Backup computes the check sums of data stored in backup and compares them to the ones stored in backup. Successful comparison means data in backup file match the original and backup is valid, otherwise it is corrupted during creation or storing. The verification result is shown is dialog box in the end of verification process. Note: During backup verification process all controls in the main windows except Cancel button are disabled and become enabled only after backup verification is complete or canceled. How to get access to an unbootable system and save data? How to use Active@ LiveCD for partitioning and restoring lost partitions?